Car donation is beneficial in so many ways. It helps to grant a wish for a child battling critical illnesses, and it also helps bring hope, strength, and joy back into a child’s life. But not only is car donation incredibly kind and generous, it is also eco-friendly and contributes to the green movement! When you donate a vehicle to Wheels For Wishes, benefiting Make-A-Wish, your vehicle will be picked up or towed away at no cost to you. Vehicles are then auctioned off for new owners to use or are recycled and reused. Wheels For Wishes accepts vehicles whether they are running or not, so your unwanted vehicle can be completely transformed into something bigger and better, while also granting a wish for a local child in your community. Each and every part of your car can be put to better use, even the parts you never thought of as being recyclable or reusable! The lives of these five car parts can be extended longer than you ever thought possible! Engines and transmissions can go on and on again! Engines and transmissions are dismantled and cleaned, reconditioned, and resold. The same goes for doors and bumpers. Once the vehicle is dismantled, it is sent to a shredding facility. Depending on tread depth and a visual inspection, tires can be reused and recycled. 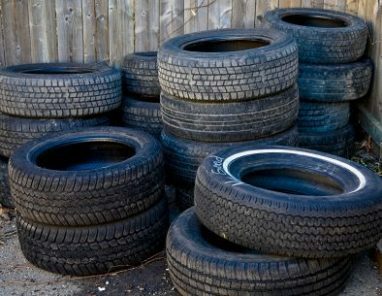 Worn tires can be recycled by shredding and cleaning them and processing them into other products such as asphalt, playground surfaces, or even garden mulch. According to Auto Alliance, worn tires can also be used as a fuel for the beneficial recovery of energy. Didn’t know that your starter or alternator could be so important? Starters and alternators can be removed and resold or sent for remanufacturing, if needed. Approximately 86% of a vehicle’s material content is recycled, reused or used for energy recovery! Are you surprised that water pumps can also be remanufactured or rebuilt? Most car parts will not go to waste! Vehicles in the United States are typically made up of about 20% recycled material. Gas tanks can be removed from a vehicle and resold. The gas can be drained for reuse, along with coolant and windshield washer fluid. According to Auto Alliance, vehicle recycling is the 16th largest industry in the United States. It is estimated to be a $25 billion per year industry! Recycling vehicles can provide enough steel to produce almost 13 million new automobiles. Why not donate your vehicle to Wheels For Wishes, grant a wish for a local child, get a tax deduction, and also contribute to the very important vehicle recycling industry at the same time? Vehicle recycling really does make a difference. Not only does is it eco-friendly and helps to extend the life of a vehicle, but it also helps to create jobs too. Auto Alliance explains that vehicle recycling helps to create jobs for 46,000 people! If you have a vehicle that has extended its life on the road and you know it could be put to better use, consider donating it to Wheels For Wishes, benefiting Make-A-Wish. Your unwanted vehicle will help to grant wishes for local kids, while also giving back to the community in a green, eco-friendly way. To donate a vehicle, please call us at 1-877-431-9474 or fill out our online donation form. Both ways only take a moment of your time, but can help change the world for the better!